The BroadLeaf BL32-B-E53, a leading energy efficient PC, boasts a high performance duel core processor with near silent operation. This DEFRA Quick Wins ‘class leader’ and Energy Star 5 qualified PC will save you a significant amount of money on your electricity bill without sacrificing quality or performance. This PC is Energy Savings Trust Recommended, exceeding the strict qualifications. The Energy Savings Trust is an independent and unbiased organization based in the UK, with a focus on promoting actions that will reduce carbon dioxide emissions and create ‘greener’ products. As a top trust on energy savings, getting a recommendation is no small feat. 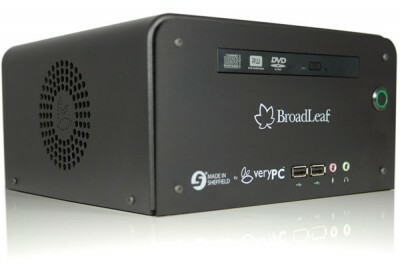 Not only is the BroadLeaf BL-32-B-E53 recommended, it’s the only home desktop PC to meet revision 5 of this certification. This revision was created to recognize PCs and laptops that are able to achieve ultra-low energy consumption, and BroadLeaf stands alone. Full of efficient features, this desktop PC uses PecoBOO software, which works with the supplied webcam to detect when the computer is being looked at and will turn the display on or off accordingly. Very PC made the BroadLeaf BL32-B-E53 PVC, BFR, and halogen free and covered it with a 100% aluminum chassis, making it ECMA-360 compliant for recyclablity. In addition, carbon is offset for both embedded and 5 years of operational life. The system runs on just 34.46 Watts of average power during operation and 31.38 Watts while idle and is equipped with Intel E5300 Duel Core Processor 2.6GHz with 2GB DDR2 800 RAM (up to 4GB), Intel X4500 graphics, 250GB Small Form Factor Hard Disk Drive, and tray loading DVDRW drive. There are 2 USB ports on the front and 4 on the back of this machine. Powerful yet lightweight, the BL32-B-E53′s case size measures 115 (h) X 220 (w) X 220 (d). An optional VESA bracket is available for monitor mounting. Available from just £529.99, this PC is comparably priced with laptops that use much more power.